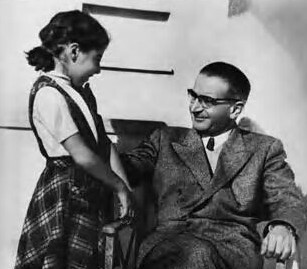 Photo caption: Rezso Kasztner with his daughter Zsuzsi in Tel Aviv in 1957. History has not been kind to Rezso (Rudolph) Kasztner. He saved more Jews from death in the Holocaust than any other Jew. His reward was the accusation that he sold his soul to the devil and assassination by Jewish extremists. But more than 60 years after he negotiated a blood for money deal with an armed and often ranting Adolph Eichmann to save Jewish lives in exchange for cash, jewels and trucks, Kasztners reputation may be restored. Two new books about him have been published and a documentary film is being prepared for distribution later this year. All paint him as a hidden hero of the Holocaust, a man who risked his life in countless bargaining sessions with the Nazis. During World War II, Kasztner, a Jewish lawyer and journalist, negotiated a train to carry 1,684 Hungarian Jews to safety in Switzerland, while he stayed behind. Kasztner had many opportunities to remain on neutral territory but he kept returning to Germany, putting his own life at risk in order to continue his mission to save others. Late in the war, he accompanied SS Col. Kurt Becher on visits to concentration camps to tell commandants to stop the killings until the camps were liberated, saving up to 100,000 Jews according to some experts. By that time, it was clear that Germany was on the verge of defeat and there would be war crimes trials afterward. In exchange for Bechers assistance in rescuing Jews, Kasztner agreed to testify on behalf of Becher at his trial in Nuremberg. Anna Porter, whose book Kasztners Train draws on seven years of research, scores of interviews and previously unknown papers, says that it is time to honor Kasztner and to dismiss the many accusations against him. The second book, German literature professor Ladislaus Lobs Dealing with Satan: Rezso Kasztners Daring Rescue Mission, is part re-examination of Kasztner and part memoir. Lob was 11 years old when he escaped with his father from the Bergen-Belsen concentration camp on Kasztners train to Switzerland. At the time, Kasztner was an obscure official of a minor Zionist committee but who had links with Jewish rescue groups in the United States, Turkey and Switzerland. After the war, Kasztner and his family emigrated to Israel. Complaints against him surfaced along with a scathing book by American screenwriter and journalist Ben Hecht. Hecht painted Kasztner as a Nazi collaborator who withheld key information from the Allies, stuffed the train with his own relatives and charged for the seats. Kasztner had saved 19 of his relatives by getting them seats on the train, but 100 other relatives died in Auschwitz. As for making money off the train, 150 people paid for tickets and that was enough to cover the costs of the other, poorer Jews. In 1952 Kasztner was accused of collaborating with the Nazis by Machiel Grunwald, an elderly pamphleteer. Kasztner sued Grunwald for libel but the trial proved to be an all-out attack on Kasztner himself, with the lone judge ruling that he had made a deal with the devil. The verdict was overturned in 1957 by the Israeli Supreme Court but by then it was too late. Kasztner, his reputation already dead in the courtroom, had been assassinated outside his home on March 15, 1957 by three extremists. Filmmaker Gaylen Rosss upcoming film has the working title, The Persecution and Assassination of Dr. Israel Kasztner. Ross likened Kasztner to the Rorschach inkblot test, a psychological evaluation in which patients are asked to interpret inkblot patterns. People put on him what they feel, Ross said. First and foremost, there is the guilt felt by the survivors for having lived while others died. Then there are the moral questions of dealing with the Nazis and of buying Jewish lives for cash, Ross said. Jews questioned the motives of other Jews, forgetting that the Holocaust was a crime against humanity perpetrated by the Nazis, not Jews. For Porter, the Kasztner story is how his acts of bravery could be so fiercely debated even though they equaled those of righteous Gentiles, Oskar Schindler and Raoul Wallenberg. He wanted to be seen as a savior of Jews, and he was essentially a good man. Schindler called him the most fearless person he knew, Porter said.